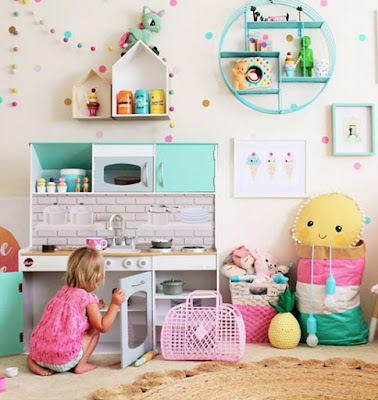 Seeing Ben mixing lego pieces in a bowl with a spoon, it has come to my attention that he and Little Missy would probably really enjoy a play kitchen. I asked Ben if he would like one and his response was, "Yes, and some food because I only have one carrot." And so began my search for the perfect play kitchen. I didn't want anything plastic, atrociously colored or too generic. 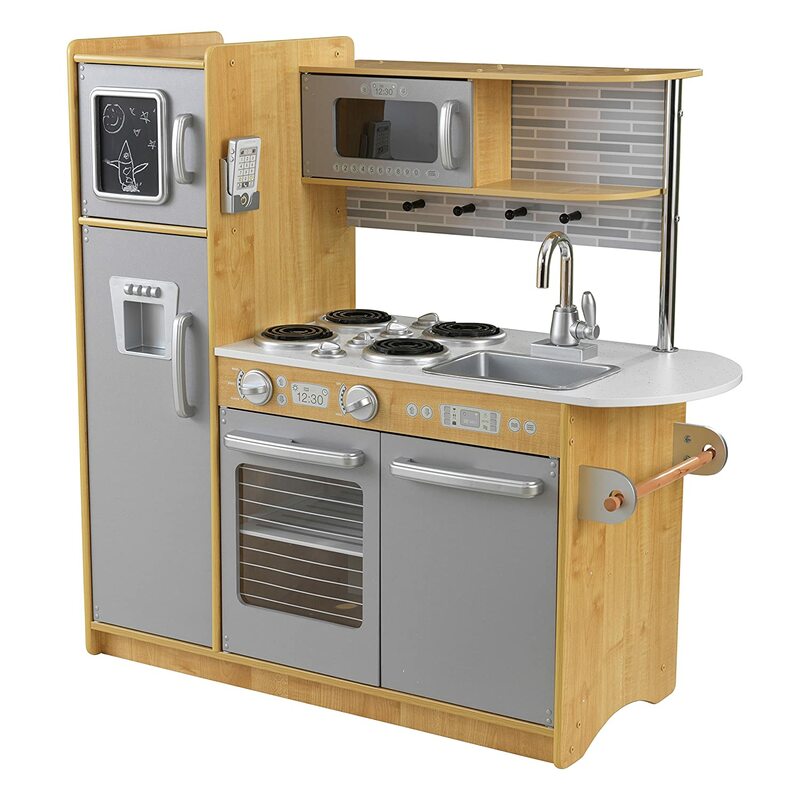 I have a vision of a high quality, wooden kitchen with a retro vibe. 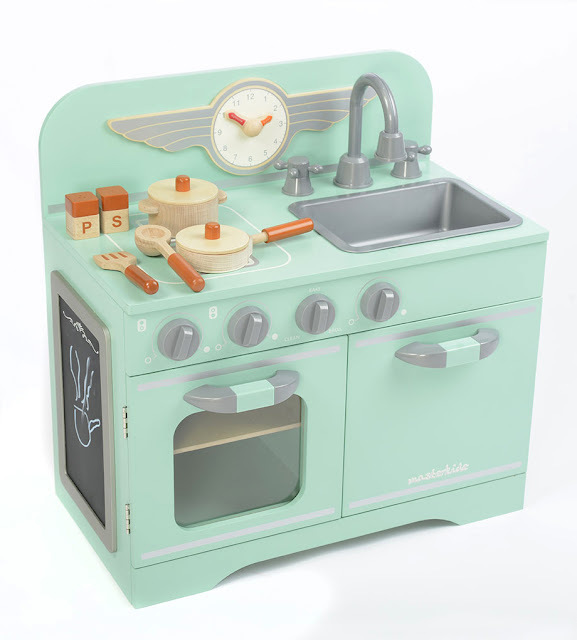 Of course in my search for perfection, I came across play-kitchens that were more awesome than anything I ever imagined. 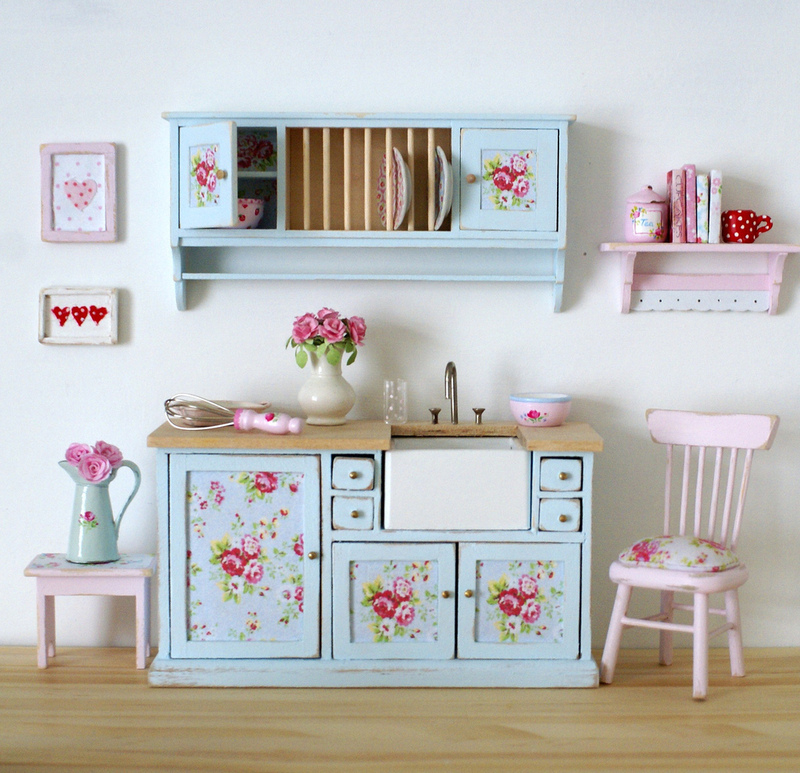 These were mostly hand made, one of a kind kitchens, made by extremely handy and creative parents and grandparents. While I love the idea of a DIY play kitchen, I'm afraid that this project is just beyond my scope of abilities. 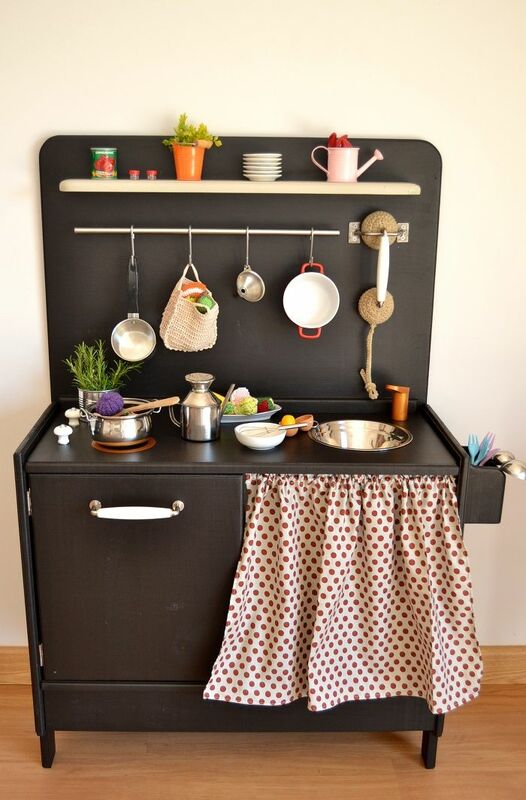 If you are a super handy person and know exactly what you're doing, a DIY kitchen can be a more economical and unique option. 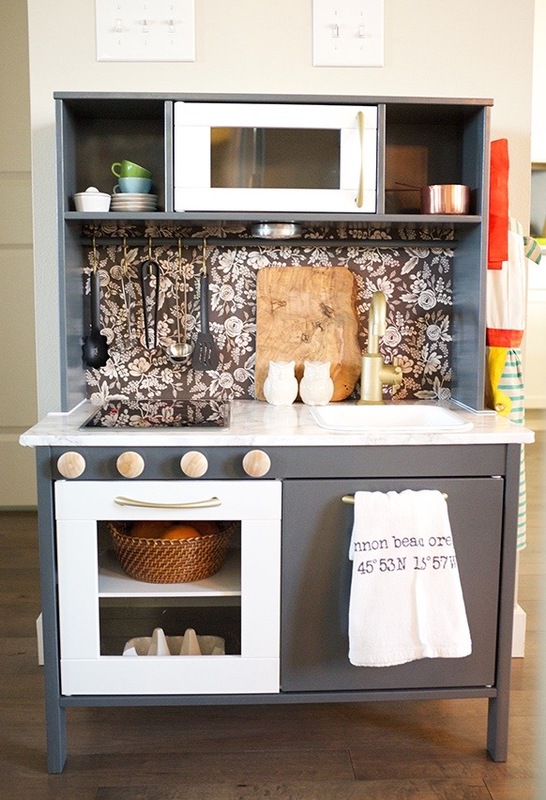 Sadly, in my case, I know attempting to do this myself would end up costing much more than just buying a pre-made kitchen. 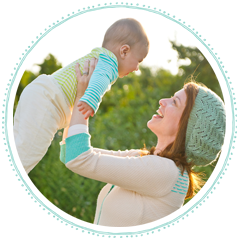 I'll have to settle for the next best thing to DIY - a premade kitchen that I can tweak a little and add personal touches to. Ok, so where does one find a pre-made toy kitchen that looks like it was handmade? Why, at Pottery Barn Kids! This Farmhouse kitchen is so, so gorgeous! It resembles the one-of-a-kind hand made kitchens and has the vintage feel that I'm craving. Unfortunately it's way out of my budget. Must stop obsessing over stuff I can't afford! Seriously having high standards without funds to match, is a curse. 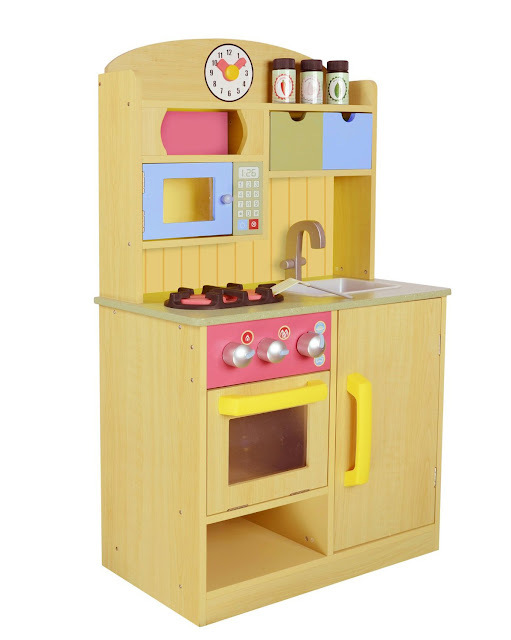 Why should I care so much about what a play kitchen looks like? Because I'm a crazy perfectionist. And no, in case you're wondering, trying to reason with my crazy self did not work. Anyhow, I consoled myself by telling myself that we need an all-in-one kitchen since space is very limited. 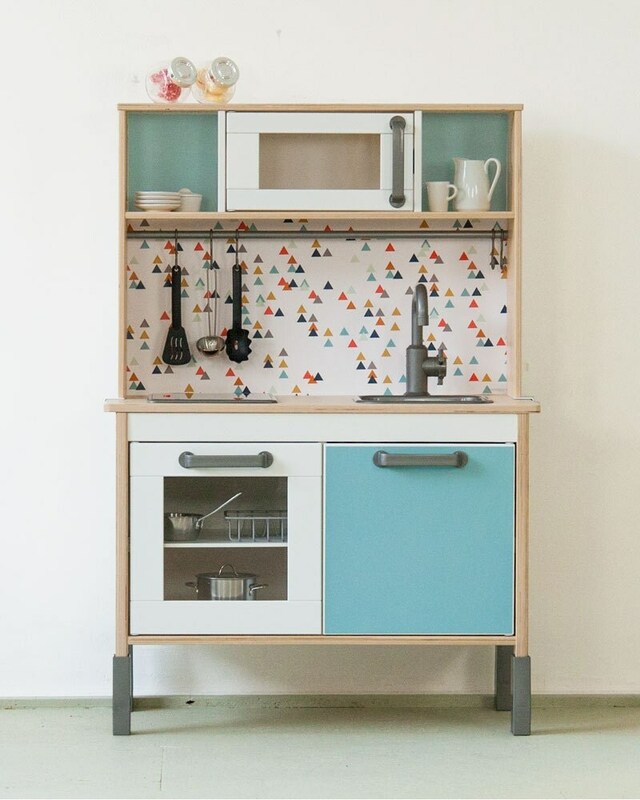 I like the look of this Country Kitchen and it would have been a serious contender, but I can't seem to find it in the US. All links are for European and UK sites. The story of my life. 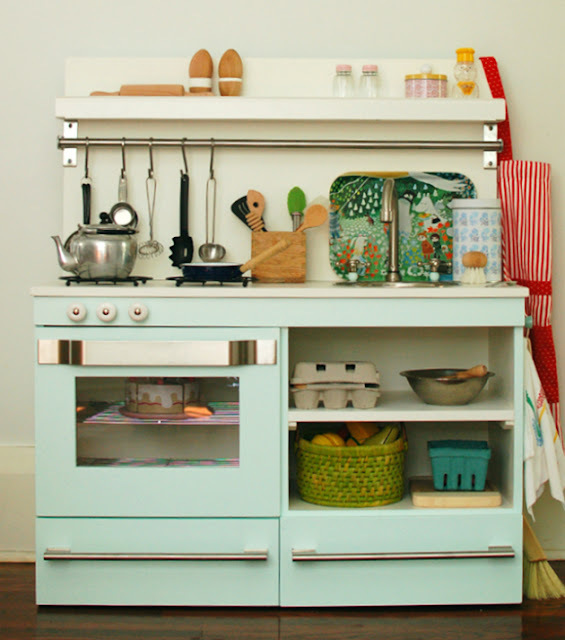 Cute kitchen and I love the mint color, but I think this one would be better suited for a younger toddler. It might be to small for 3-year old Ben. 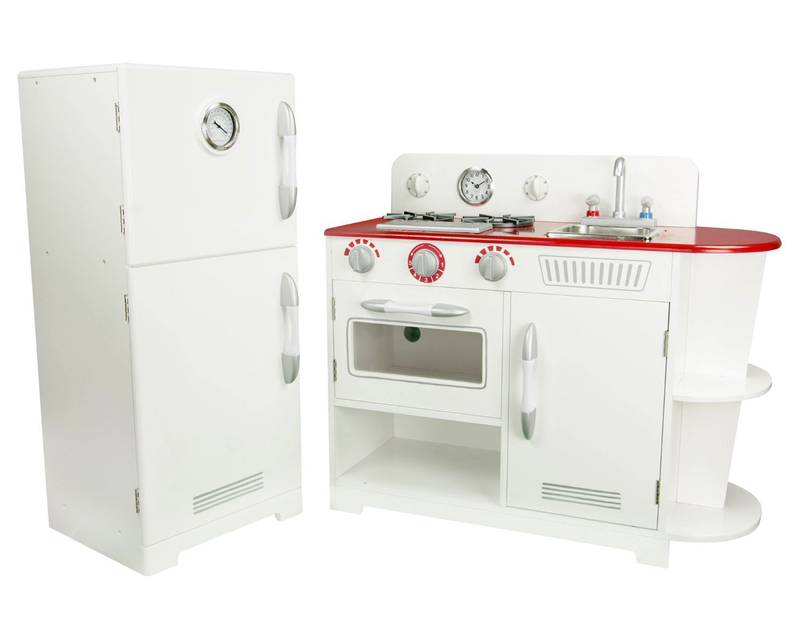 Next I turned my attention to some very generic play kitchens that have all the functions my kids would love. 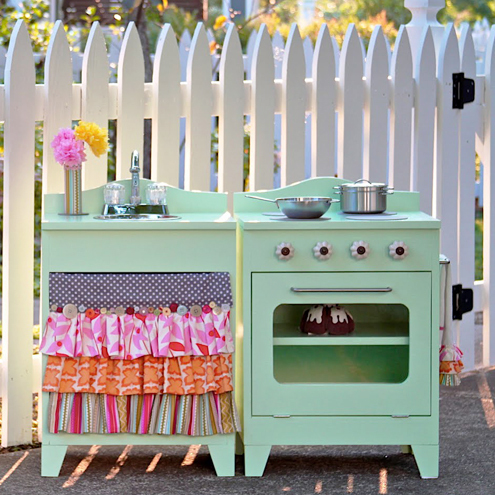 I'm considering painting one of these over and changing the handles. Maybe putting in a real mini faucet? This kitchen maximizes on play space. The reverse side features a doll house! There's always the IKEA DUKTIG kitchen, which has been upsycled and made over by many creative household. I like the clean lines on this one and I suppose I can handle painting it and adding some personal touches. 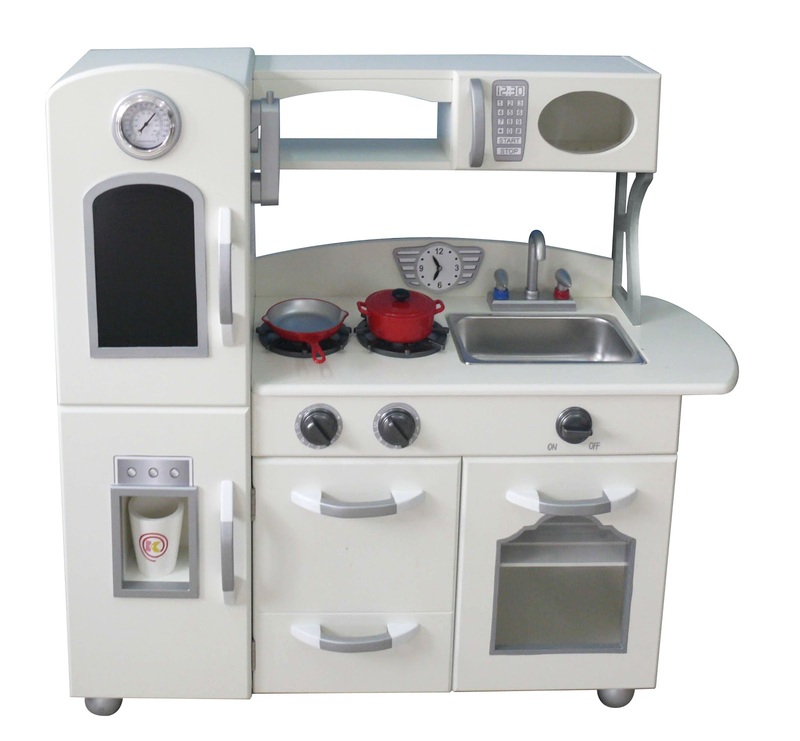 My only problem with this kitchen is that it doesn't have stove knobs. Just adding some decorative knobs is not enough, I think Ben and Little Missy would really enjoy turning them and hearing a clicking noise. Any idea how to accomplish that? So what will it be? Dilemmas, dilemmas. 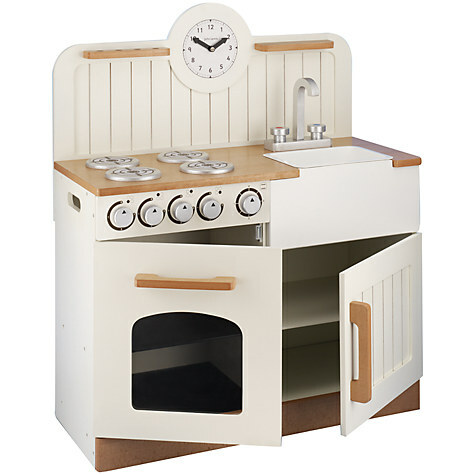 If anyone knows of a play kitchen that I might have missed and that fits my criteria, please comment! Did you end up finding one?? I'm having the same problem!! 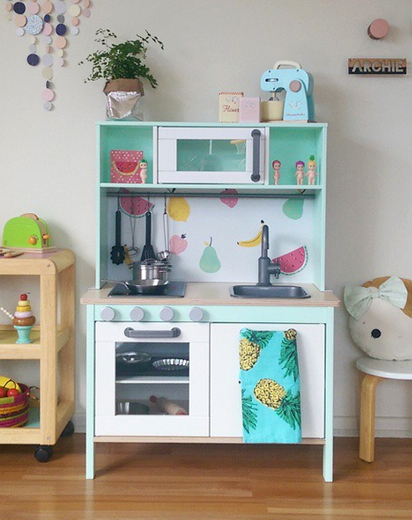 I can't find any cute play kitchens that aren't an eyesore or require too much effort on my behalf. 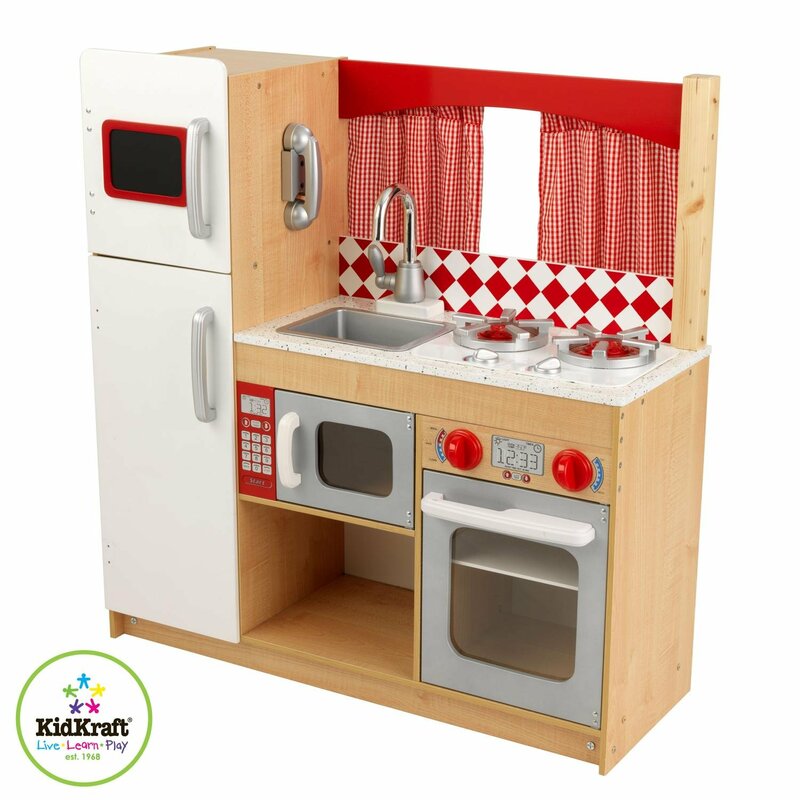 I haven't seen any others that you haven't called out already, but Kidkraft also has a two piece set that looks nice. Their one piece is similar to the teamson version but a lower price point.